On Friday, Clive Palmer’s campaign sent me an unsolicited SMS. The SMS, all about fast trains in Sydney, was sent at 233PM. The SMS was sent without any opt-out mechanism. The fact the campaign is using “Make Australia Great” as a slogan is a real stomach turner for me. I am dual citizens of Australia AND the US and another politician in the US has used a similar slogan the past three years for his own agenda. A bitly user has reported a problem. A black-list service reported a problem. The link has been shortened more than once. We have detected potentially malicious content. The warning goes on to say “spam or malware is very often propagated by exploiting these loopholes, neither of which bitly allows for”. Days after receiving the SMS, I clicked the hyperlink again. It appears to be fixed. You no longer get sent to the warming page. The hyperlink now sends you to the United Australia Party website. I’d imagine whoever generated this SMS received multiple complaints, including those from the campaign for likely using improper links in the SMS. I hope they have also learned of the need to offer us a way to opt-out. When I attempted to opt-out my message was rejected. Either Clive Palmer does not like “get lost” as opt-out language or the campaign is not fully prepared to receive positive or negative responses through their SMS platform. Clive, check here for ADMA’s paper on opt-out. There is nothing worse than sending a deceased person mail. 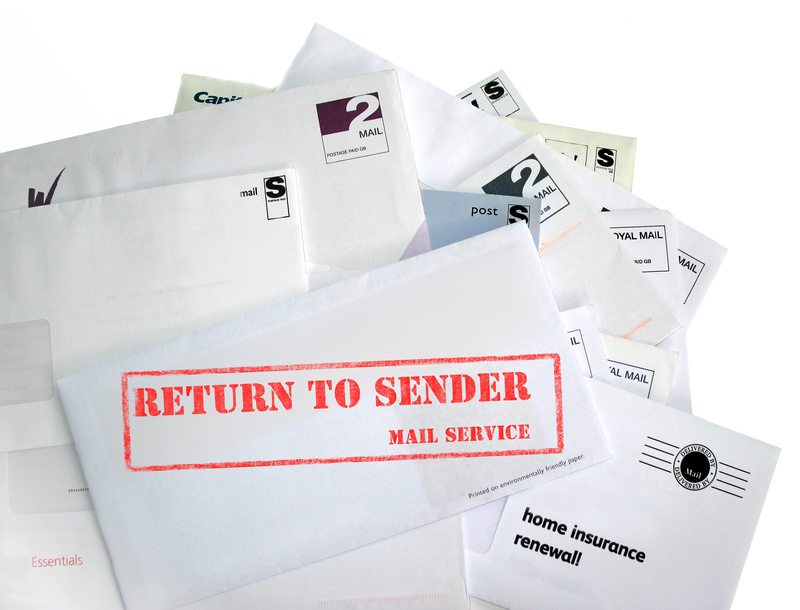 First, it stirs up emotions when a loved one receives a letter addressed to a person who has since passed. Second, it sends a message that your non-profit organisation lacks best practices. I recently posted, on LinkedIn, about the number of charities not taking the extra steps to remove deceased from their CRM/database – reactively or proactively. The post received a high number of comments. Perhaps it was a little too close to home for some. This past month, I visited some people in the US in the state of Florida. The husband of the couple visited was the executor for an estate. Let’s call the deceased Mrs Bloggs. Mrs Bloggs has been deceased for more than five years. Yet, the household continues to receive charity mail in her name. Again, Mrs Bloggs has been deceased for more than five years. What’s even worse is this household has notified the charities of her death. The couple have returned notices in the response envelopes with the response coupons. In some cases, charities have been notified 2-3 times. These same charities, and others, continue to mail to Mrs Bloggs. The charities are risking offending the survivors, as well as their reputation through poor processes, wasted materials, and postage. US charities have an even bigger advantage over Australian charities in that the Social Security Death Index (SSDI) exists, which is national register of deaths. When someone passes away in the US, it is a requirement the death is reported to the US government. The end result means all deaths are documented on the SSDI. US charities have access to this list to screen their database through a variety of suppliers. In Australia, the Australian government does not yet have anything compared to the SSDI. Yet, Conexum has The Australian Bereavement Register (TABR), which is a strong product and increasing in capabilities each year. Additionally, suppliers will match your database against the Australian Direct Marketing Association (ADMA) list of deceased individuals. This list is developed via notifications sent to ADMA. Any person may document a death via the ADMA website or we may call or write ADMA direct. Document date of notification, method of notification, and date of death. Notify list brokers of deaths. Pass information to list brokers when charities are notified of deceased parties on various lists rented or received via exchange. Notification to list brokers should include date charity notified by next of kin, method of notification, and date of death. Screen your non profit organisation’s CRM/database using SSDI, for US charities, or TABR, for Australian charities. Screen at least one time per year. Better yet, screen prior to all major mailings. Screen your CRM/database, plus any lists rented for acquisition purposes. You would never rent thousands of names without deduping them against your database to ensure you were not marketing to existing donors. Take it a step further. Whenever your organisation rents or exchanges names via a list broker, ensure you de-duplicate all known deceased from your CRM/database. Save your organisation the embarrassment of mailing to known deceased people despite the fact the lists may be dirty from a broker or from a charity. Then, report deceased back to the broker to save your colleagues from embarrassment, as well. Those of us who work for charities have been on the receiving end of the calls when people are upset because we have erroneously mailed to their deceased loved ones. If everyone takes an active role, in the New Year, in terms of deceased processing, we can vastly improve processes and ensure we decrease the number of times deceased persons are marketed. Need help with your deceased processes? FundraisingForce assists charities globally to improve deceased processes and others. Contact us today. It’s the holiday season – a time of year of well wishes and surprises. As a donor to hundreds of Australian non profit organisations, I am most surprised by the lack of well wishes from charities this year. I have received plenty of requests for support via Christmas since September. However, to date, I have received a total of three greetings or wishes from – one from charitable organisation and two from professional organisations. 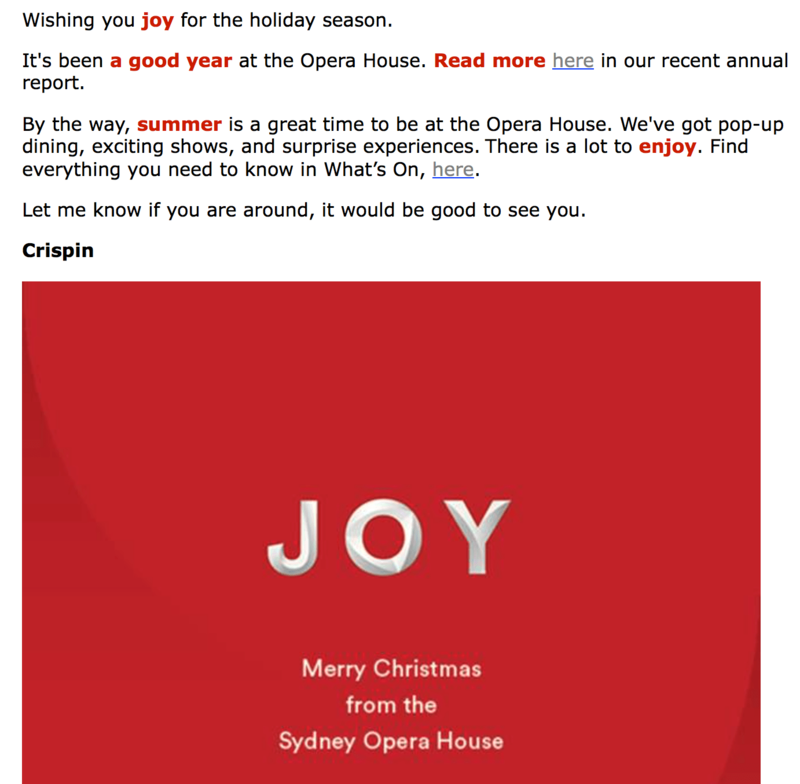 The Sydney Opera House is the only non profit organisation to take the time to send Christmas greetings. The greeting, via Email, was multi-purpose, including: offering joyful wishes of the holiday season, as well as a calendar of upcoming events, and the opportunity to take in all the Opera House offers. The other two greetings received were from professional organisations, including CFRE International and Australian Direct Marketing Association (ADMA). As we rush out of the office to commence our Christmas and New Year’s breaks, it takes nothing more than a few minutes to craft an email and include a holiday graphic to let donors, volunteers, and others know you appreciate their support and to remind them there is ample opportunity to give one last gift before year end. Charities tend to spend a significant time planning and analysing appeals. Why not take a bit of time to express appreciation and to wish your donors well in the New Year? Merry Christmas and Happy New Year from FundraisingForce.